This topic has 70 replies, 26 voices, and was last updated 4 years ago by cruzcampo. 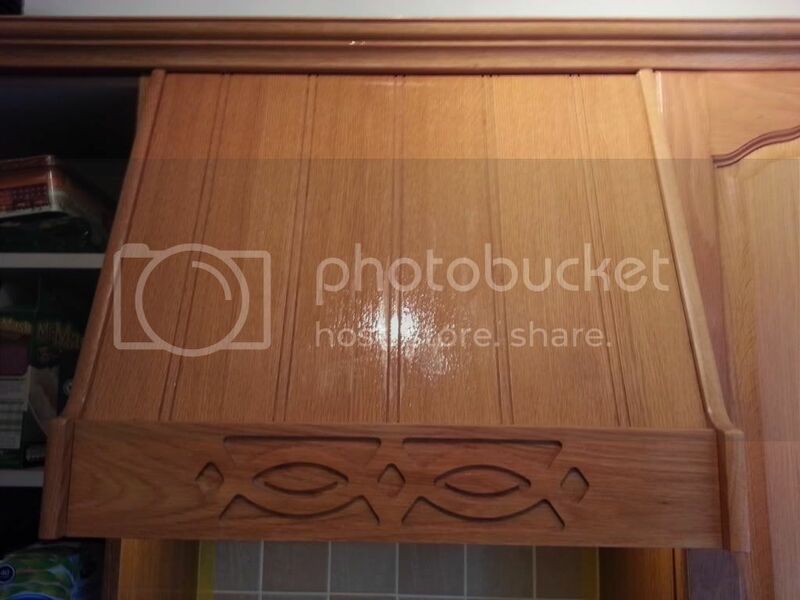 So i’m giving the kitchen cupboards an upgrade, changed the handles to some swanky silver pieces, and want to paint the wood in a shiny contemporary finish. Thinking cream or black. but the reviews are terrible. I’m now thinking some kind of primer, with a good satin/eggshell paint (never had much joy with gloss and it discolouring over time) and apply with a roller. Plastikote spray paint is excellent and comes in a wide range of colours. I did some melamine wardrobe doors – 2 coats of primer, 2 coats of gloss and for added optional protection 2 coats of clearcoat. 30 minutes between each coat, you should get a kitchen done in a morning. Not the cheapest mind you, but the result was surprisingly professional! 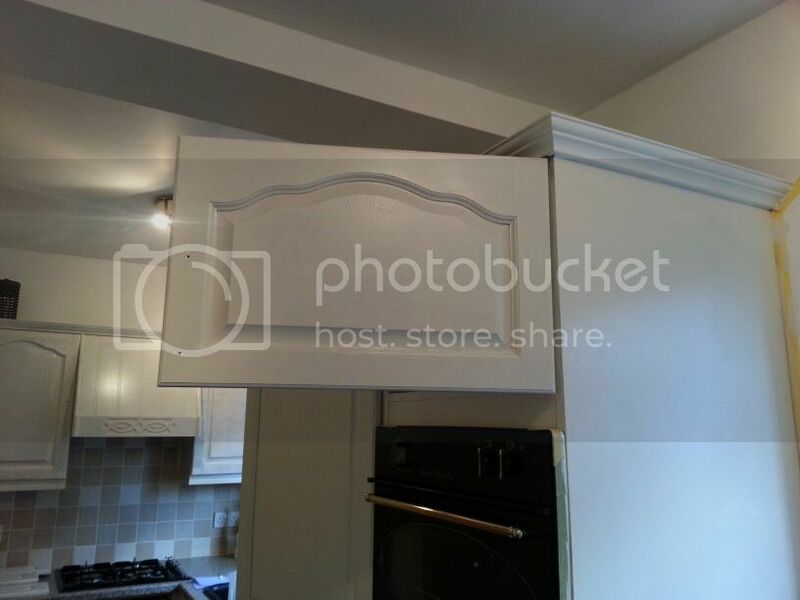 I used the cupboard paint and although it’s not awful it does chip fairly easily. 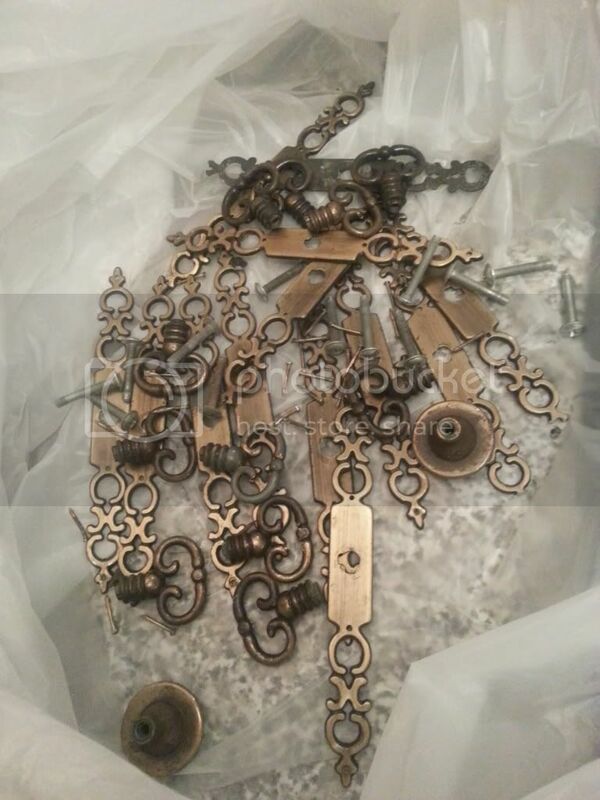 Went on well and gives a decwnt finish if you prepare the doors well first. Mine was a quick fix though, wouldn’t want it for ever. You need to prepare them really well first. Give it a good washing down with sugar soap and don’t miss any bits. It’s a kitchen so they’ll be full of grease. Then sand it all down with fine grade sand paper. If you skimp on these two parts then you may as well not bother. 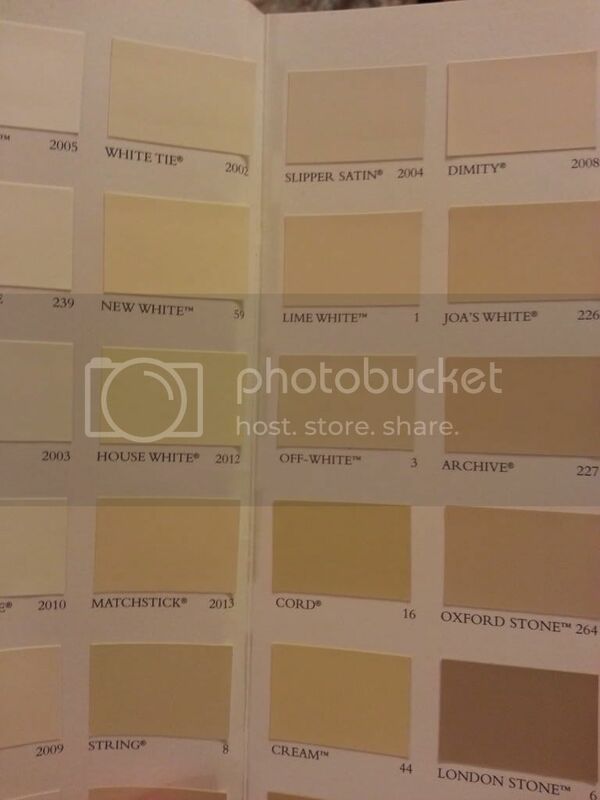 You don’t need to limit yourself to the likes of Ronseal Cupboard paint as you buy something like Dulux Super Grip Primer and then your choice of a good Eggshell finish in whatever colour you want. Should last you years, done right. 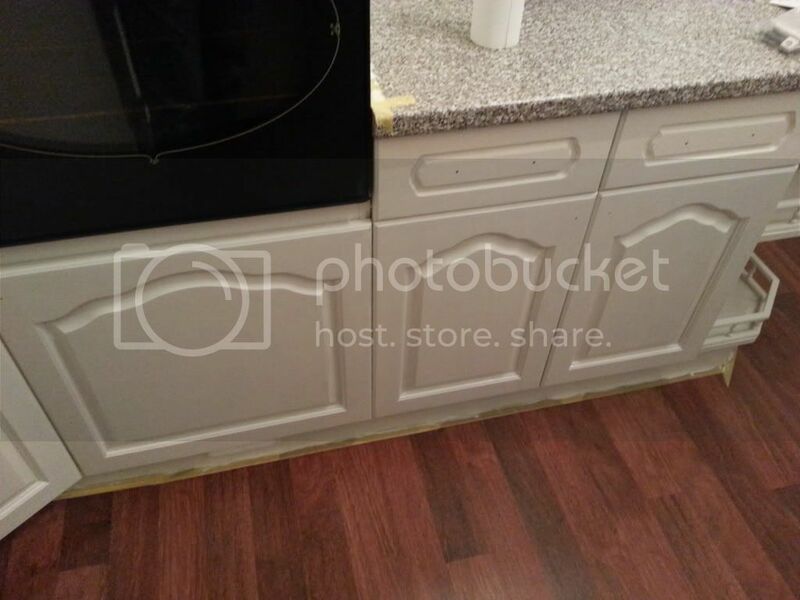 My wife does Shabby chic furniture and was recently asked to do a kitchen. 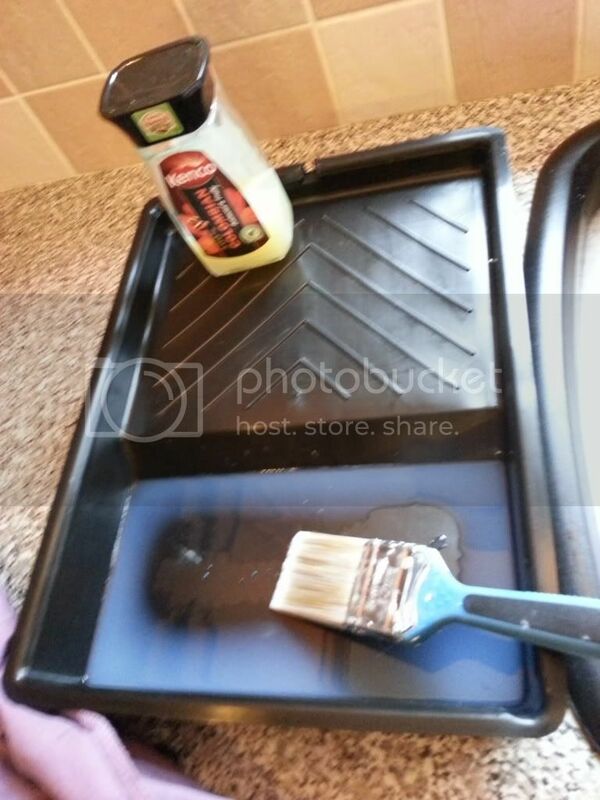 As mentioned above, sugar soap to get the grease and dirt off and then a good sand before priming. She also painted around the corner of the shut lines to reduce the chance of chipping. It can look really good if you take the time, time will tell how durable it is! At last,something I actually know a bit about on here so I don’t have to make it up as usual. Forget ‘cupboard paint’ stick with Eggshell as previously mentioned. Wipe cupboards down using ESP Primer,this gives the paint a chemical bond to stick to.Works really well,I’ve been back to kitchens I painted 8/9 years ago and it hasn’t chipped or peeled at all. Now straight on with the Eggshell.3 coats for a nice finish,lightly sanding inbetween.I prefer Farrow & Ball ( used to be terrible paint but the water based eggshell is fantastic ), it’s quick drying and very low odour. You could leave it at that but I finish the kitchens with a water based laquer from Morrells,you chose the amount of sheen you want. I’m two weeks into painting our cupboards from dark wood to cream. 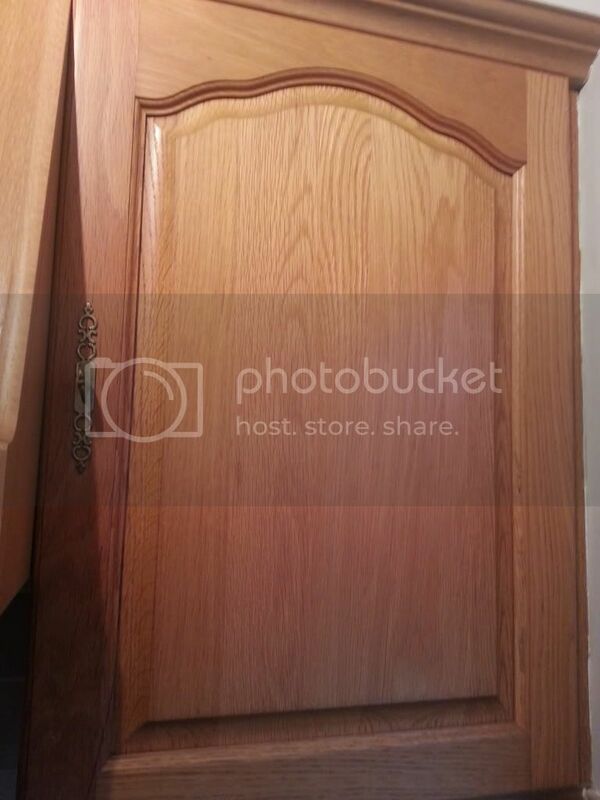 Using Crown cupboard paint. Not having enough room to lay many doors down at once us a means it’s a slow process. The finish looks good if yiu use a mini foam roller but its 4 coats for the outside and 3 for the inside. Used sugar soap then a light sand. The paint is very easy to damage for a few days but seams fairly tough aftet that but only time will tell. I may use lacquer if it proves to easy to damage. As others have said preparation is the key. Also lots of thin coats are better than a few thick ones. A light sanding between coats may be needed but you have to keep an eye out and feel to see if and dust e.t.c has settled during drying. Thin coats dry quicker so it doe not take that much longer and the difference in finish is between bodge job and pro. Supurb advice guys cheers! 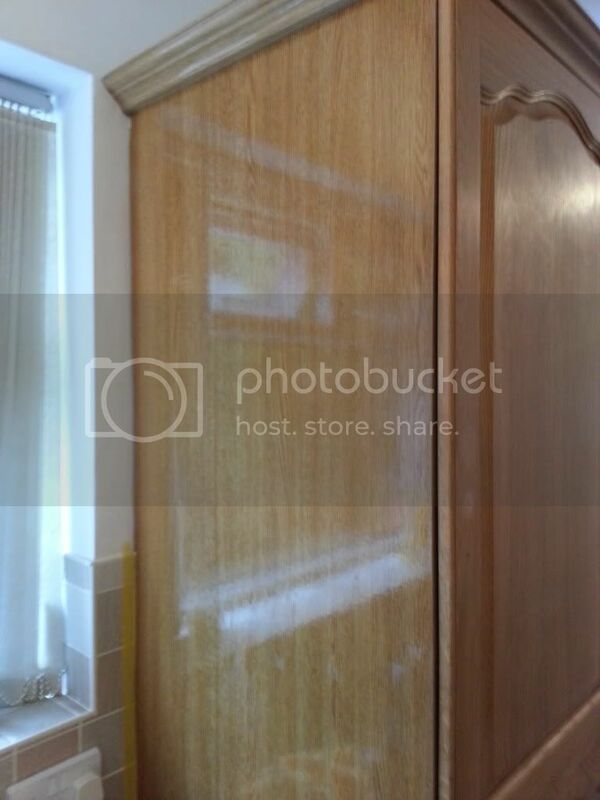 some real cupboard paint expertise on here! @sausagefingers some of those kitchens are supurb! love the blue island kitchen. also where do you reccomend best place to buy the ESP primer, farrow and bell paint, and mohair mini rollers. DIY sheds selection is terrible when I was looking earlier. @chorlton sugar soap added to the list! @cheers_drive i’m hoping it won’t take more than a weekend 😆 Probably over optimistic of me though! @sausagefingers – Some fantastic looking stuff on your site there. Really like the overall design and little details. Here’s what I always do. I prepare by using those wet n dry sanding pads dipped in a mild sugarsoap solution, I find the flat Bosch sanding pads the best, wipe of residue and allow to dry. Cupboard paints are shite as stated above, my favourite primer is Blackfriars problem solving primer. 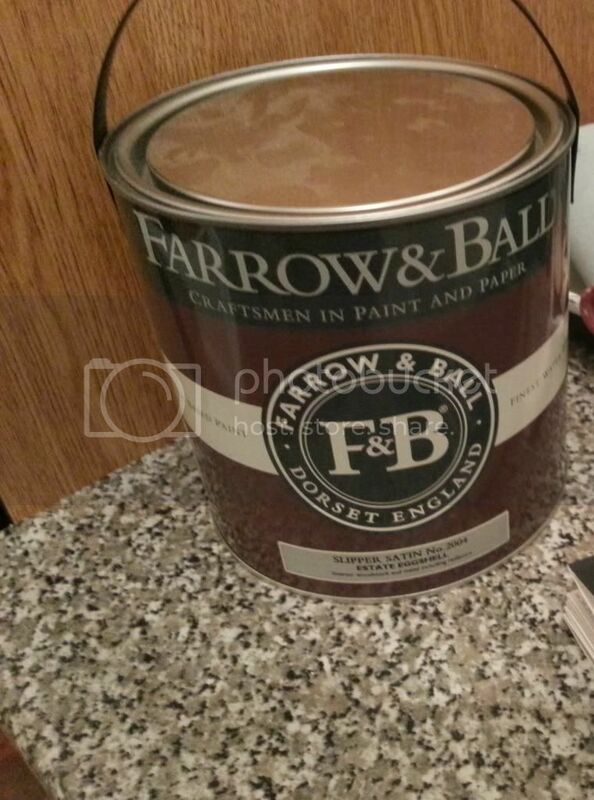 Also stated above is Farrow and Ball eggshell which beats any other water based coating hands down, if I get all shabby chic and distress the surface then i finish with a dead flat water based varnish like J H Ratcliff or polyvine. 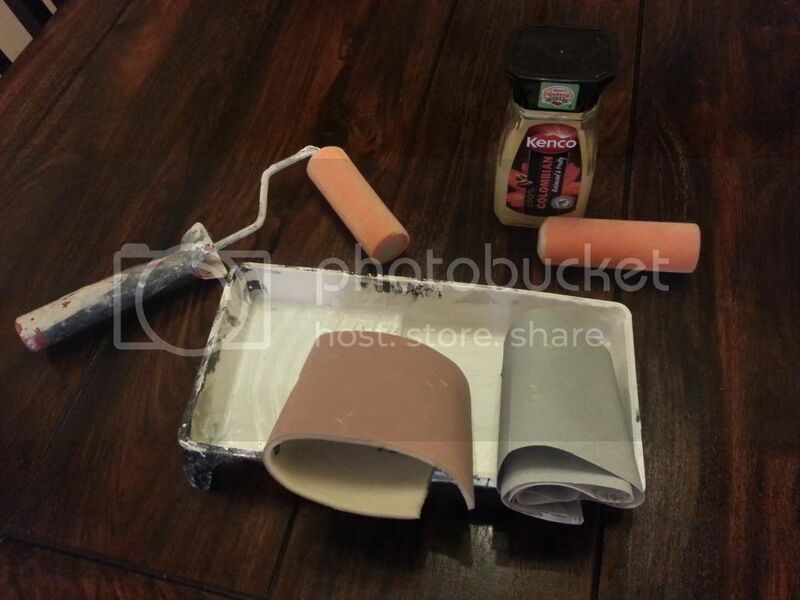 You may come across a miracle paint called Annie Sloans chalk paint while searching the web……..don’t. Buy your stuff from a decorators merchant, it’ll be cheaper and better quality. Also, even when the paint feels dry it will need quite a bit longer to cure properly. 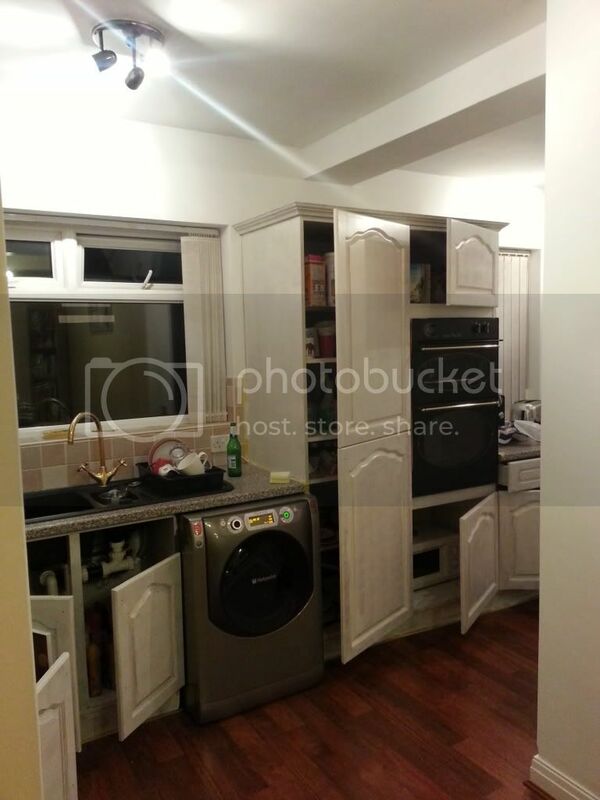 Had our kitchen units painted twice now – once when new and a repaint about 6 years ago. 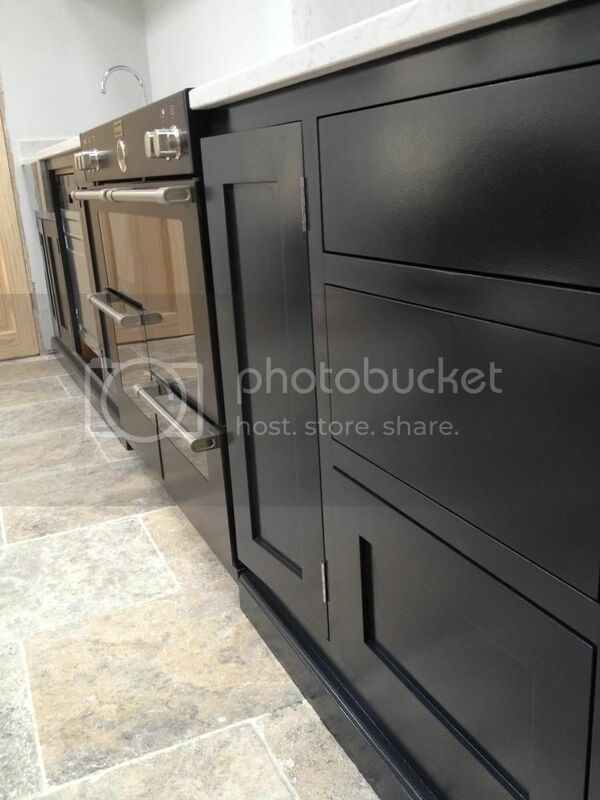 Repaint was done using F&B eggshell (no top lacquer as we like them matt) and still looks great. That’s in a family of 5 with 1 x dog. Also they recommend dark tones undercoat, do you think this or ESP, which im finding hard to buy locally. 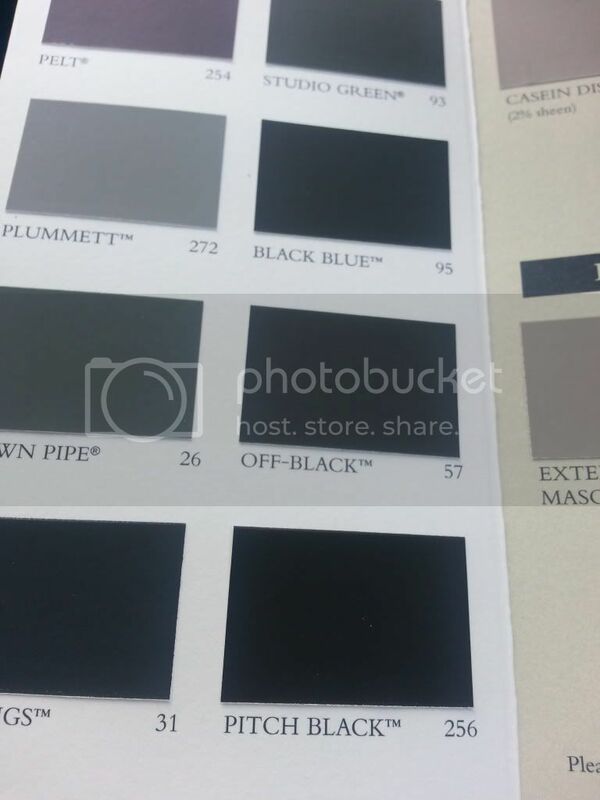 To be honest you won’t see much difference between the two shades once on the cupboards.I’ve just done a kitchen in off black and it’s one of my favourites but I did find it was a bugger for drying which I put down to a lot of pigment in the paint. The ESP was purely to give the paint a key and to be honest I wouldn’t paint a kitchen without it.Whereabouts are you? If you’re local I don’t mind nipping round and lending you some.Eggshell is perfectly fine to be used as an undercoat so don’t buy any extra paint just give it a coat of the black for u/c. That one is off black with a 40% sheen laquer.To be honest it looked fine without the laquer but the customer insisted on it.Eggshell is very hard wearing so I wouldn’t bother with the laquer if it was my own kitchen. Which white is generally the best finish? That ESP routine sounds too easy though, ESP then eggshell as the U/c, then normal coats on top, can’t wait to crack on with it. 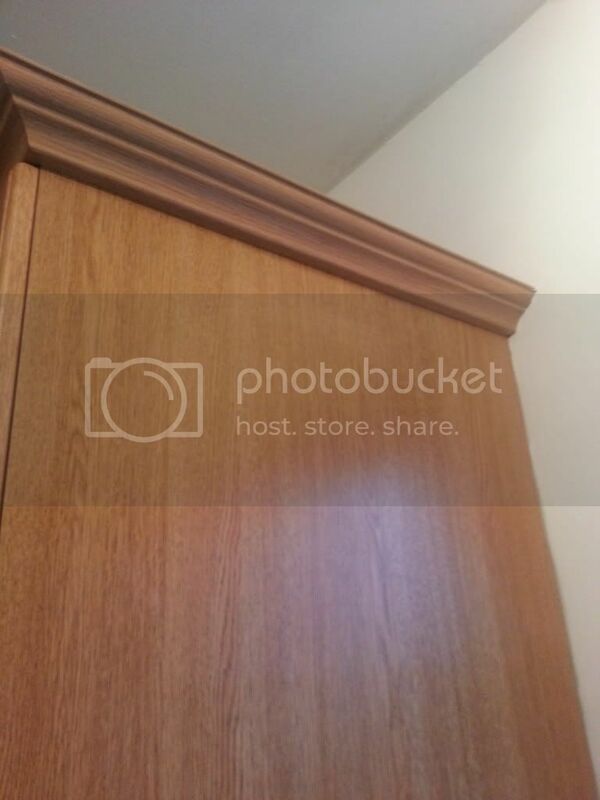 Heres the sides of the cupboard, melamine? 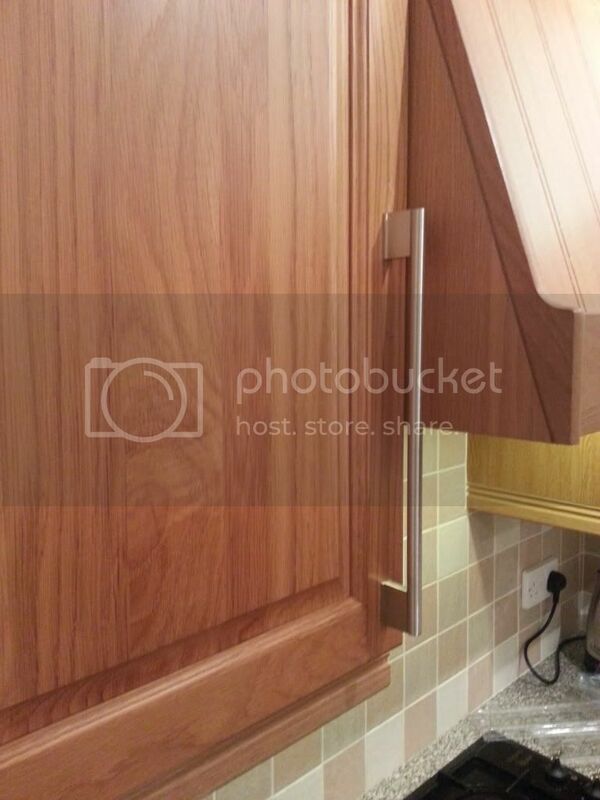 cupboard doors with the retro handles! ps. will this ESP do? I can meet up with you and lend you my stuff,I’m in Sunny Burnley. I’ll have a look in my van but I should have enough for what you need. 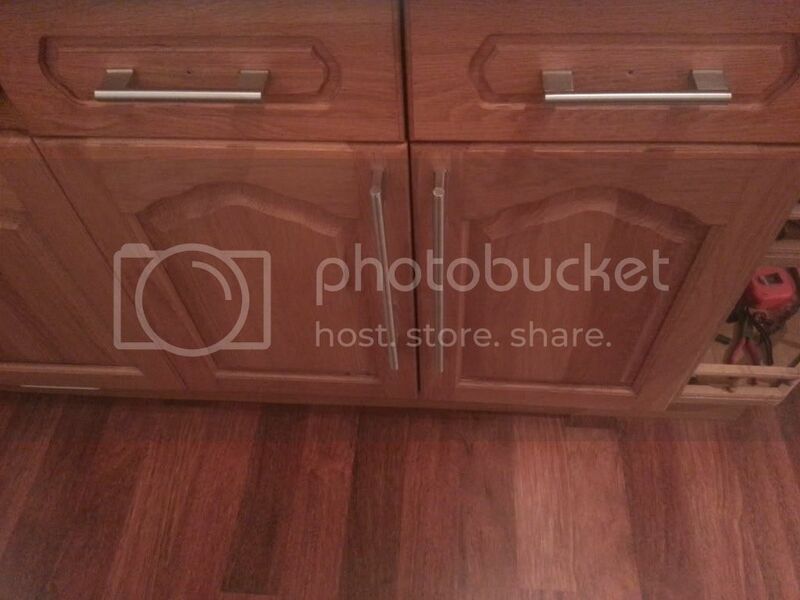 The kitchen we did had those same handles OP. 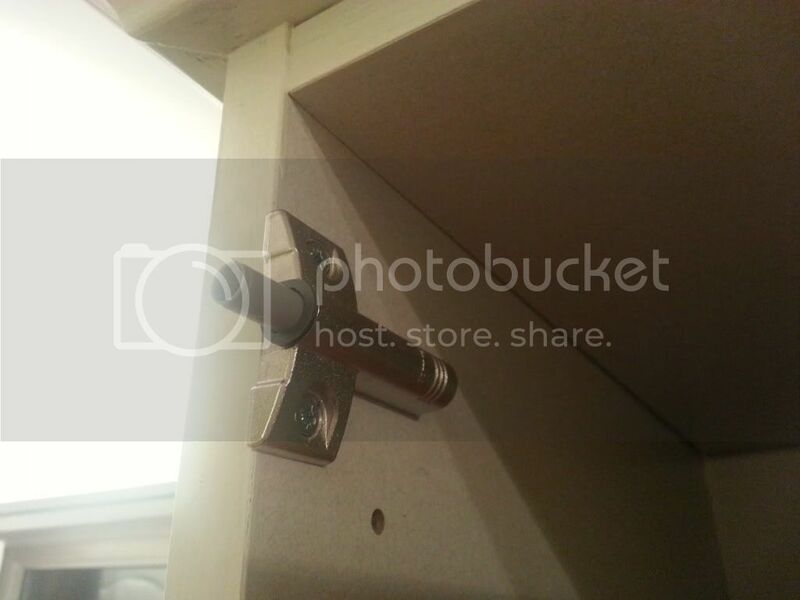 They will need a little filler where the pins are that help to hold the backing plate on. Do it first, then you wont be spoiling your lovely finish later! Chose the Slipper Satin in the end, looked at a lot of white kitchens and liked the off white. and got the undercoat done, which covered fantastic, although very white and not very slipper satin, but i’m guessing the next few coats will bring the proper off white colour out, along with the drying. Are you going to paint the insides of the doors? Or do what the pros do. Find a local spray finisher and get him to do a proper job. Mine charges me around £1.50 sq ft. I have to get the doors to him in a prepped state though. You will get a perfect finish and proper hard wearing paint. wasn’t going to at first, but think it will give it the finished look. 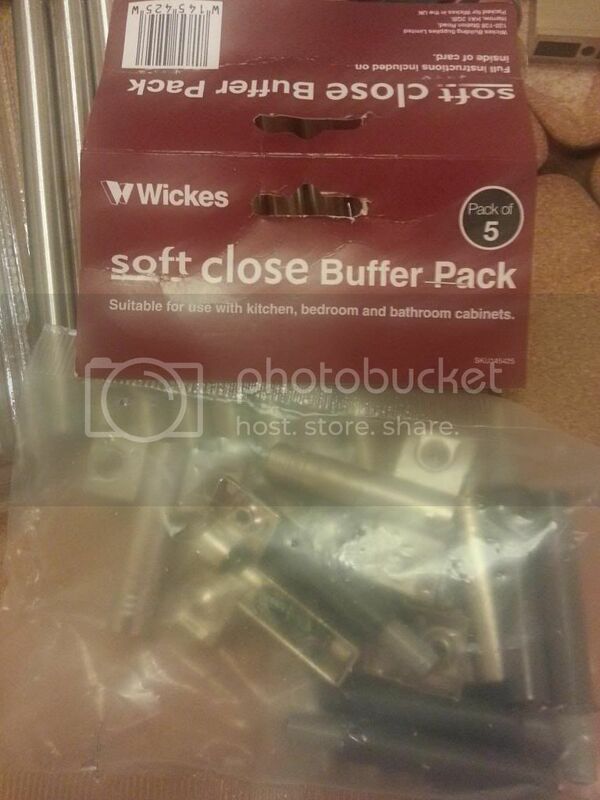 I love those soft close thingies, must get some for when I paint my kitchen cupboard doors very soon. 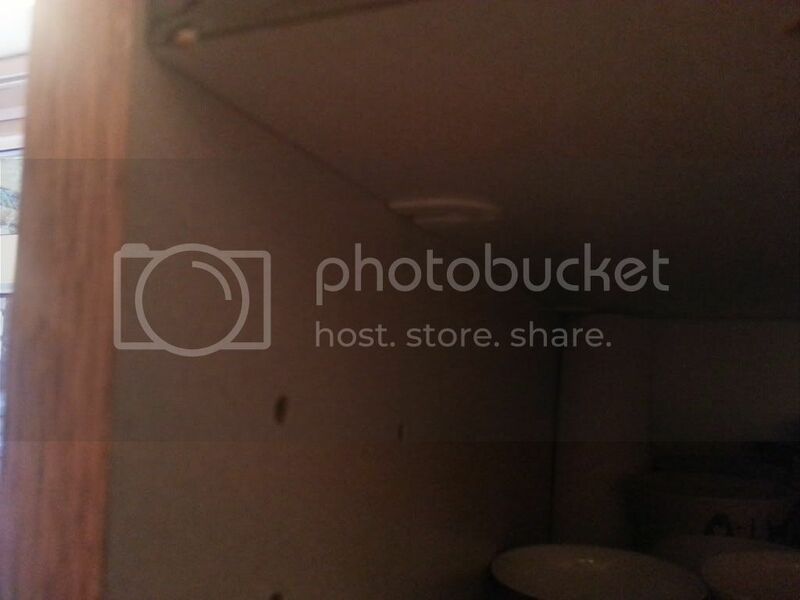 Just got to find some of that ESP stuff – it does work on melamine doors doesn’t it? 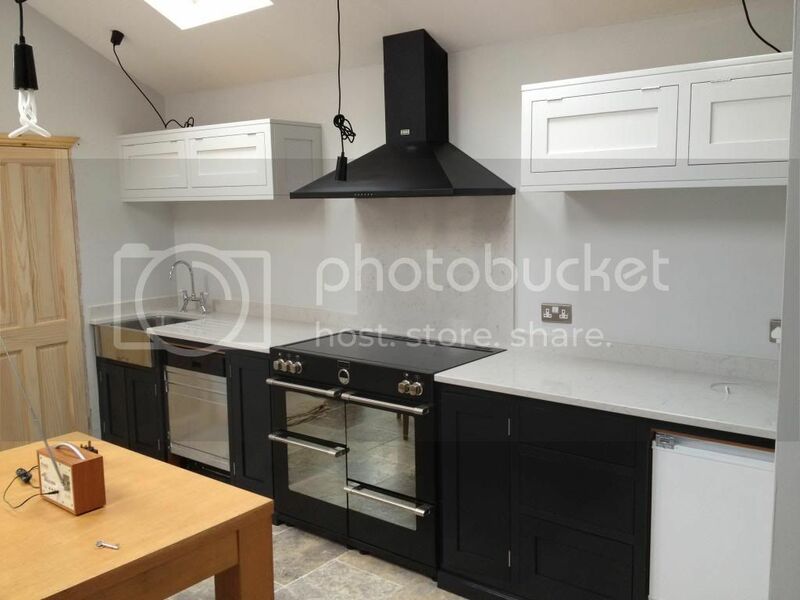 Blimey – we’ve got the same kitchen, but ours looks to be in a darker shade. I have considered doing this, but wasn’t sure how modern handles would look on an older style door. Looks very nice though so far. Interesting that with the right primer you don’t need to sand. Did you paint the doors with them in place? Or removed? 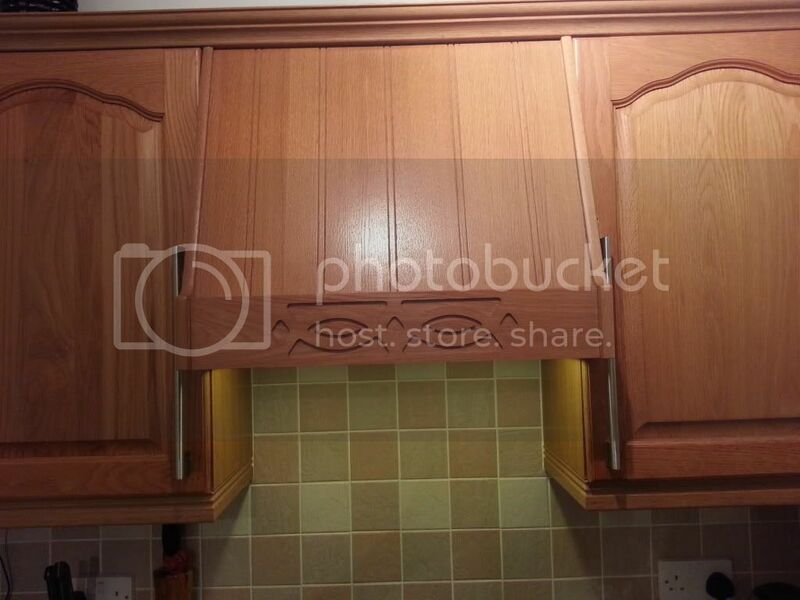 @ stumpy have you got the same hob hood too? Thats the bit I wasnt sure about painting white, but it looks pretty good. Painted doors in situ, less faff, can dry all round too without propping up, and only build up of paint is at the base of door pattern which can easily be brushed out. Reckon flat they’d be more build up, in grooves. Sausagefingers who paints these regular leaves in situ too. 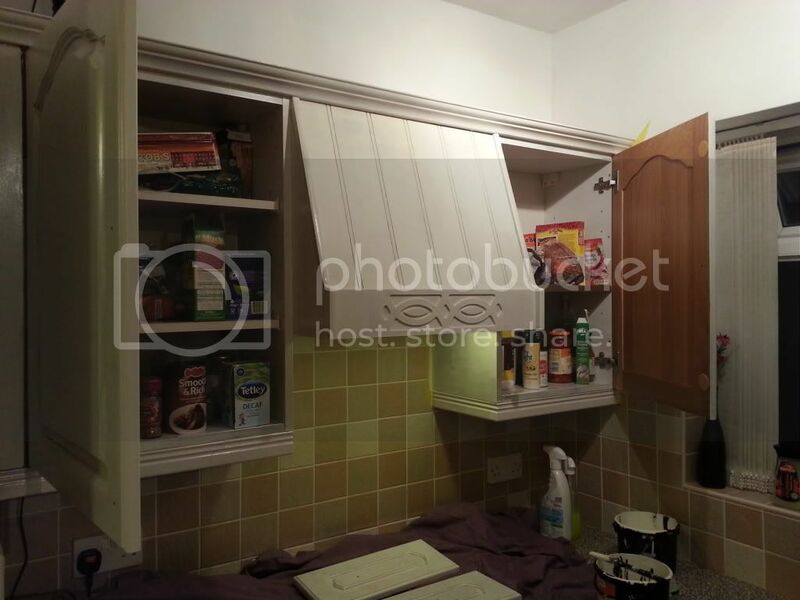 The topic ‘Painting kitchen cupboards…’ is closed to new replies.